For a rich and delicious cake that's moist and chocolaty, you're going to need a flourless chocolate cake recipe. If you are allergic to wheat but still want to enjoy dessert, then this is a great flourless cake recipe for you. Even if you are just looking for a cake with great texture and deep chocolate flavor. this is the recipe for you. When making this cake, or any cake for that matter, the best way to prepare the pan is to spray it with non-stick spray, cover the pan with parchment paper, then spray the paper with non-stick spray. If you are making this cake on a half sheet pan (if you are making a baked Alaska for instance), then just cover the bottom of the pan with the parchment. If you are making a round cake, cut the parchment paper into a round that fits the bottom of the pan. Melt the butter and chocolate in a Bain Marie. 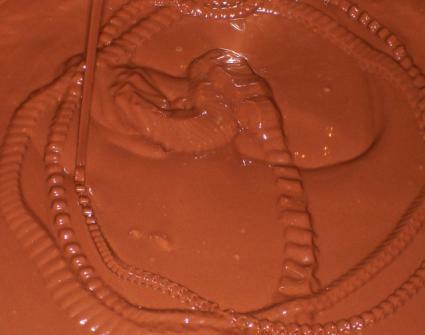 Whip yolks and sugar to the ribbon stage and fold it into the chocolate. Whip whites to a medium peak and fold into the yolk/chocolate mixture. Pour into a 9-inch round pan (or a 9x9 square pan) that has been prepared with non-stick spray and parchment paper. Bake at 350 degrees Fahrenheit until set and dry to the touch. Check at 30 minutes. If you made the round cake, you now have an incredibly rich cake with a nice complex chocolate flavor. When I make this cake, I, of course, cover it with ganache. But if you like, you can use a half sheet tray instead of a round cake pan. Once it is cooled, cut out small rounds of the cake and use it as the base for a baked Alaska. Baked Alaska is so easy to make once you have the flourless cake made that you may just find yourself making it every night. Okay, maybe not, but it is fun. For this you will need Swiss meringue and some ice cream. You can use any ice cream you like or make your own. I like lavender ice cream. Put a 3-inch round of flourless chocolate cake in the middle of a plate. Put two scoops of ice cream on the cake. Place in your freezer. Now make some Swiss Meringue. Stir the egg whites and sugar in a Bain Marie until it reaches 110 degrees Fahrenheit and the sugar has been dissolved. Pour the egg/sugar mixture into the bowl of your stand mixer. Whip until it is glossy. Using a piping bag, pipe the meringue over the ice cream. Caramelize the meringue with a blow torch.